SpaceX is offering just 200 sets of its limited edition space mission patches through its online apparel and accessories store at shop.spacex.com. The company responsible for the first private spacecraft to resupply the International Space Station introduced a different type of space supply for sale — mission patches. Space Exploration Technologies, or SpaceX, updated its online shop on Friday (Dec. 7) to offer embroidered emblems for its rocket and spacecraft flights for the first time. Based in Hawthorne, Calif., SpaceX is led by millionaire entrepreneur Elon Musk, who also co-founded PayPal and Tesla Motors. 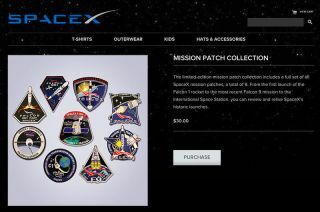 "The limited-edition mission patch collection includes a full set of all SpaceX mission patches, a total of 9," SpaceX wrote on its website at shop.spacex.com. "From the first launch of the Falcon 1 rocket to the most recent Falcon 9 mission to the International Space Station, you can review and relive SpaceX's historic launches." The insignias also include the patch for the June 2010 maiden flight of the Falcon 9 — the booster's first stage nine Merlin engines are highlighted on the emblem — and the company's first flight of the Dragon in December 2010 that established the capsule as the world's first private craft to orbit the Earth and be safely recovered. The gumdrop-shape Dragon, which from its start has been designed to eventually carry astronauts to space, too, is one of two commercial spacecraft contracted by NASA for resupply services and one of three such vehicles currently being developed for the space agency's commercial crew program. The Dragon is currently the only cargo craft that launches from the United States, and the only vehicle worldwide that can return significant amounts of cargo to Earth, after the retirement of NASA's space shuttle fleet in 2011. All but three of the nine SpaceX patches share a common design element: a four-leaf clover. It wasn't until the fourth flight of SpaceX's Falcon 1 in September 2008 that the company achieved its first successful spaceflight and as that mission's emblem included the small green icon, all of the company's flight patches have since included a clover for good luck. SpaceX is offering just 200 of the nine-patch sets for $30 each through its website. The package ships with a color information card embossed with a metallic Dragon logo. Previously, only one of the patches in the set, that of the emblem for the May 2012 second test flight of the Dragon spacecraft, was authorized for sale to the public. Click through to collectSPACE.com to see the nine SpaceX mission patches in detail. Visit shop.spacex.com for more information and to purchase the patches.